WASHINGTON — Humidity and unseasonably high temperatures will join forces for a sweltering beginning of the week in the D.C. area. A heat advisory has been issued for the D.C. area on Tuesday afternoon. Even though July is historically D.C.’s hottest month, summer heat isn’t giving up headed into September. Tuesday, Wednesday, and Thursday this week could feel like some of the hottest days the region has seen this year. Check WTOP’s complete weather forecast. 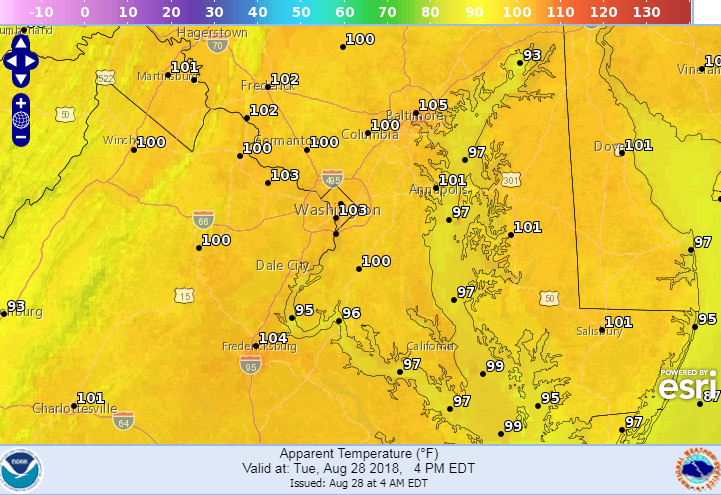 Heat indexes — a measure of how hot it really feels, combining humidity with the actual air temperature — are expected to soar above 100 degrees from Monday to Thursday in Baltimore, D.C., and most of Maryland and Virginia east of the Blue Ridge mountains, including the Eastern Shore. On Tuesday morning, the National Weather Service issued a heat advisory for most of the D.C. area from northeast Virginia through Baltimore from noon until 8 p.m. With high temperatures and humidity, it’ll feel like 105 degrees in parts of the region on Tuesday afternoon, and the agency advised the public to reduce time spent outside. According to the National Weather Service, a heat index around or above one hundred is considered dangerous, with a significant likelihood of heat-related sickness without proper care to limit exposure. Adding to the heat, a code orange air quality alert was also in effect for the D.C. metro area, meaning that “air pollution concentrations within the region may become unhealthy for sensitive groups,” including children, the elderly, and people suffering from respiratory illnesses. A conveyor belt of hot air will propel the eastern half of the country as much as 15 degrees above normal temperatures for this time of year. Among the recommended precautions: Drink plenty of water, avoid outdoor activities like sports and gardening, and wear light-colored clothing together with a hat and sunscreen. Read more heat safety tips from the National Weather Service. Relief might not come until Thursday evening, when a round of thunderstorms could finally bring temperatures back down to the mid 80s in time for the weekend — though a sticky air mass will linger.